The Nextsens­ing Project has added 10 new NextSen­sors. The co-founder of Bril­liant Lab, the author of Rein­vent­ing You, the VP of the Inno­va­tion Pro­gramme Office at DSM, the Man­ag­ing Direc­tor of Tal­ent & Lead­er­ship Solu­tions, the Exec­u­tive Direc­tor of Exec­u­tive Edu­ca­tion at the Mac­quar­ie Grad­u­ate School of Man­age­ment, the founder of Bom­bay Cloth­ing, some­one who has worked in the busi­ness devel­op­ment area in both Asia and Ocea­nia, some­one who is com­mit­ted to find­ing the best way to mea­sure iconic­i­ty, a New York-qual­i­fied cap­i­tal mar­kets lawyer with expe­ri­ence work­ing in three of the top finan­cial cen­ters of the world, and the Exec­u­tive VP of Prod­uct and Oper­a­tions for Intralinks — all of these ultra-tal­ent­ed peo­ple are now part of our nextsens­ing ini­tia­tive. I am both thrilled and hon­oured to have the oppor­tu­ni­ty to work with them as well as with our equal­ly tal­ent­ed orig­i­nal 16 NextSen­sors. What do NextSen­sors do? When I invite peo­ple to join our team, I tell them that there three main ways they can par­tic­i­pate in our work. NextSen­sors are anten­nae. Our team uses social media to track trends and often sug­gest top­ics for us to write about. They also help to broad­cast devel­op­ments on our site. NextSen­sors are inves­tiga­tive reporters. Whether work­ing on a per­son­al inter­est and try­ing to pin down what they sus­pect is “next-wor­thy” or whether they are involved in a major com­mu­ni­ty effort, such as our NextBrief on the future of tele­vi­sion, our team mem­bers are work­ing to think in new ways. NextSen­sors are authors. I invite any of our team mem­bers to write a guest blog, and many have. Fea­tur­ing the indi­vid­ual thoughts of our team mem­bers is always a high pri­or­i­ty! You can read about all of our NextSen­sors on a new­ly-designed web page. Just click here [link] or on the “Project Team” but­ton off this home page. For now, allow me to intro­duce you to our new mem­bers by this quick name list: Nede Al-Dihany, Dorie Clark, Jorge Fer­nan­des, Siegfried Hoen­le, Paul Kirk­bride, Deep Mehta, Nan­cy Mu, Kyle Pier­son, Jen­nifer Poh, Fahim Sid­diqui. 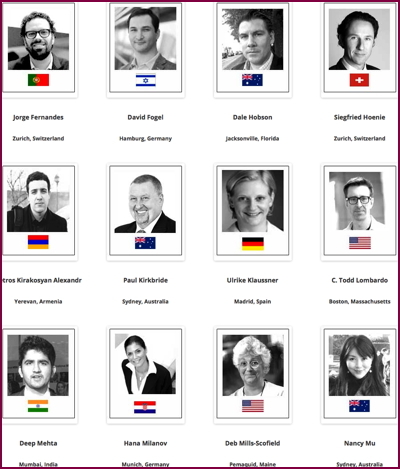 By the way, the NextSen­sor team now rep­re­sents 17 dif­fer­ent nation­al­i­ties based in 24 cities — from Madrid, Spain, to Cor­do­ba, Argenti­na; from Syd­ney, Aus­tralia, to Boston, Mass­a­chu­setts; from St. Peters­burg, Rus­sia, to St. Peters­burg, Flori­da. The Nextsens­ing Project is a glob­al project. I am priv­i­leged to be able to work with such a fan­tas­tic team!